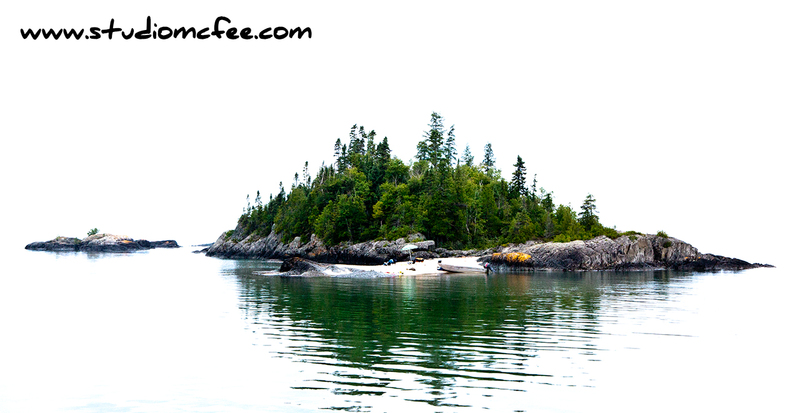 Driving north through Lake Superior Provincial Park there are spectacular views of the lake and its rugged shoreline. But north of Old Woman Bay, the Trans-Canada Highway veers inland. You can no longer see the lake. A bit further north, closer to Wawa ON, there are secondary roads that lead back to the shore. The locals know these places but travelers have to discover them for themselves or (gulp) talk to the locals. The roads lead to very nice beaches, an old abandoned dock at Michipicoten Harbour and … Spirit Island. Not sure what prompted me to overexpose this photo but the result left only the island and its reflection. At first I was annoyed that someone was interfering with my pristine view - a beach umbrella and motorboat are unlikely elements in my photos - but the more I looked the more I liked the quirkiness of this image. In fact, I have made myself a canvas print. It hangs in our dining room. Venturing off the beaten path frequently leads to creativity. I keep re-discovering this truth.